Gutter systems play an important role with regards to maintaining the durability and strength of your home, which is why you should pay special attention to the condition of your gutters. Poorly maintained gutters can lead to extensive damage that hinders the structural integrity of your home and is very costly to repair. Damages like erosion, wood rot, and shifting foundations are just a few of the issues that can arise when your gutters are allowed to degrade and malfunction. At Ultimate Gutter Guard of Huntsville, we want to help you protect your home from such devastation, which is why we’ve composed a list of some common signs of gutter failure. Sagging Gutters: A definite sign that a replacement gutter system is needed, sagging or pulling gutters expose your home’s fascia, landscape, and foundation to significant water damage. Separated Gutters: When gutters aren’t properly connected to one another to form a continuous channel, it results in water falling through the trough and to the base of your home. Water Pooling: Occurring at the base of your home, this indicates that your gutters are not directing water away. It could be a result of a clog in your gutter system causing the water to backup and overflow or poor installation. Peeling Paint: Paint peeling around or on your gutters can mean a couple of things. One is that your gutters are at the end of their lifespan. The other is that the area is constantly exposed to water over an extended period. If it’s the latter, it could mean that you have a clogged causing water to back up and overflow. Cracked or Split: Small damages such as cracks or splits can turn into big problems very quickly. They increase the potential for extensive damage to your fascia board, shingles, and more. Water Damage: If the area behind your gutters exhibits water damage, you most likely have water overflowing due to a clog in your gutter system. A high-quality gutter system can do wonders for the confidence you feel in the protection of your home. The innovative design of our K-Guard system makes it ideal for redirecting rainwater and remaining clog-free. 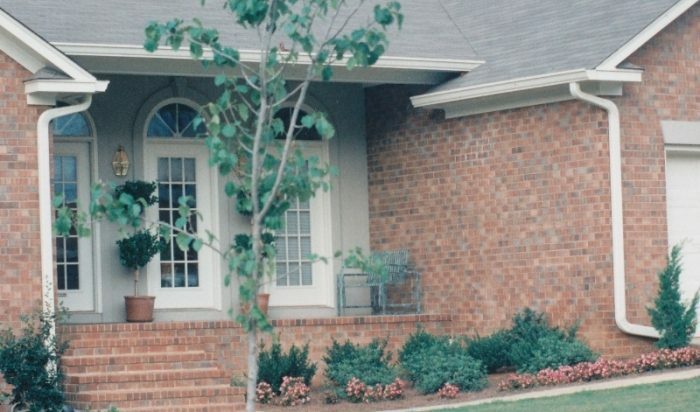 The experts at Ultimate Gutter Guard of Huntsville would love to equip your home with our high quality gutter system so you can be confident in your rainwater management system. Contact us today to schedule a free consultation and save yourself a great deal of heartache and money with our gutter protection system.